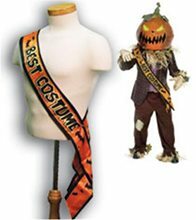 Best Costume Sash.Includes: One "Best Costume" Sash.Available Size: One Size Fits Most Adults.Dimensions: 10cm x 82cm.Satin Best Costume halloween sash (10cm x 82cm). The perfect award for any costume party! Funniest Costume Sash.Includes: One "Funniest Costume" Sash.Available Size: One Size Fits Most Adults.A great gift award for any costume party this Halloween! Award Ribbon 3pk.Includes: 3 Award Ribbons (1st, 2nd, 3rd).Party & Seasonal. 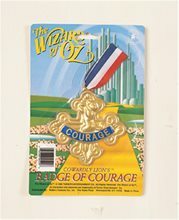 Package includes (3) award ribbons that come in three colors (orange, purple and green). Each Ribbon has a black spider with 1st , 2nd and 3rd printed on it. 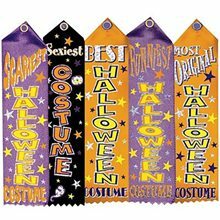 Halloween Costume Award Ribbons;Use these Halloween Costume Award Ribbon Multi-Pack to award costume contest winners at your Halloween party. The ribbons included in this Halloween Costume Award Ribbon Multi-Pack are also perfect for work or office Halloween costume contests.